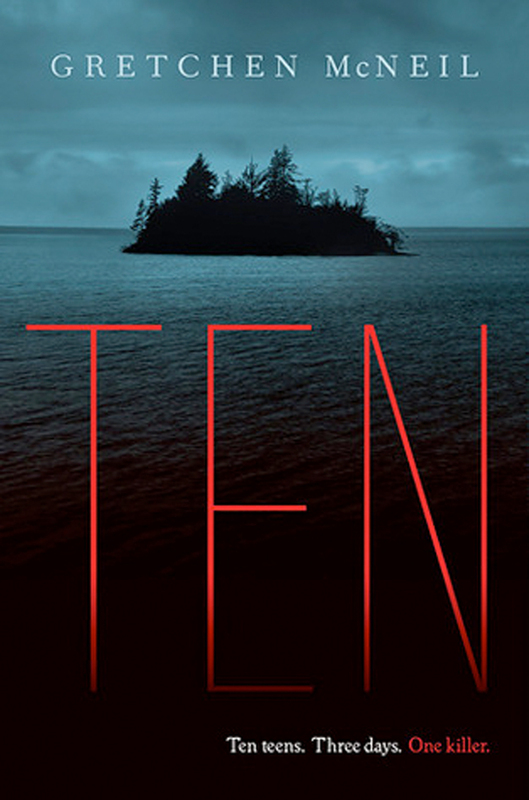 With a hook claiming to be a modern-day Agatha Christie’s And Then There Were None, I had high hopes for Ten by Gretchen McNeil. Then I realized Gretchen McNeil did the voice of a character on a short-lived but very much-loved (by me) animated show on G4TV called Code Monkeys, a show dripping with raunchy witty humor. I thought this would be brilliant! I first fount this title during my Young Adult literature course (it was on a YALSA list somewhere… or won an award… one of the two), and purchased it through Amazon’s Kindle store for $1.99. Seeing what I paid for it again in print doesn’t make me feel as bad about buying it… But part of me wishes it was only $0.99. The structure should already be familiar to anyone who read And Then There Were None, or fans of the movie Clue. The story even starts the same — guests traveling on a ferry-boat to an island in the middle of a storm. Ten introduces us to a cast of high school students, all fraught with ex boyfriends and jocks, the one black guy, an asian girl, and nerds. Okay, I’m thinking, cliché, but let’s see where this leads. The cast is spending the weekend on this island to celebrate graduating. I think. It wasn’t really clear, and didn’t really matter anyway. They make dinner together after awkward interactions, and someone nearly dies from finding nuts in their salad. Ooh, scary nuts! Yes, they were allergic… So I suppose anaphylactic shock would be a little clever way to knock someone out right away… but let’s move on. The kids find a movie and pop it into the DVD player and there’s an odd reel of slashing and scrambly clips and words flashing on the screen and paint slashes on the wall, like a college freshman’s first attempt at a visual arts assignment. The film foreshadows everyone dying, basically. For anyone wanting to read this, I suppose I’ll leave out the spoilers… but I found the whole story played out like a discount-bin horror flick. I suppose that’s all you really need to know. The story whittled down to somewhat of an anti-bullying story, except the victim was a kook. And I had to recount the number of people who died, because of the ten teenagers… **SPOILER** two survive… meaning only eight died… (Oh, but that’s right, there were two random neighbors’ bodies found in that one scene…but that seems like a cop-out). I suppose retitling the book to EIGHT wouldn’t have had the same impact… Unfortunately, Ten did not inspire a ten-star ranking. To wrap things up: The idea was there, the creativity was sorta there, the execution was a bit lacking. The book would have been a bit more enjoyable if it had been shortened. In defense, I think it’s a bit difficult to compose a mystery like And Then There Were None without duplicating it. Sadly, I think the blurbs you read about this book may provoke a more imaginative story in your own imagination than reading the full story. Now if only I could slash this title off my list with a swatch of red paint just like in the book. That would be satisfying. 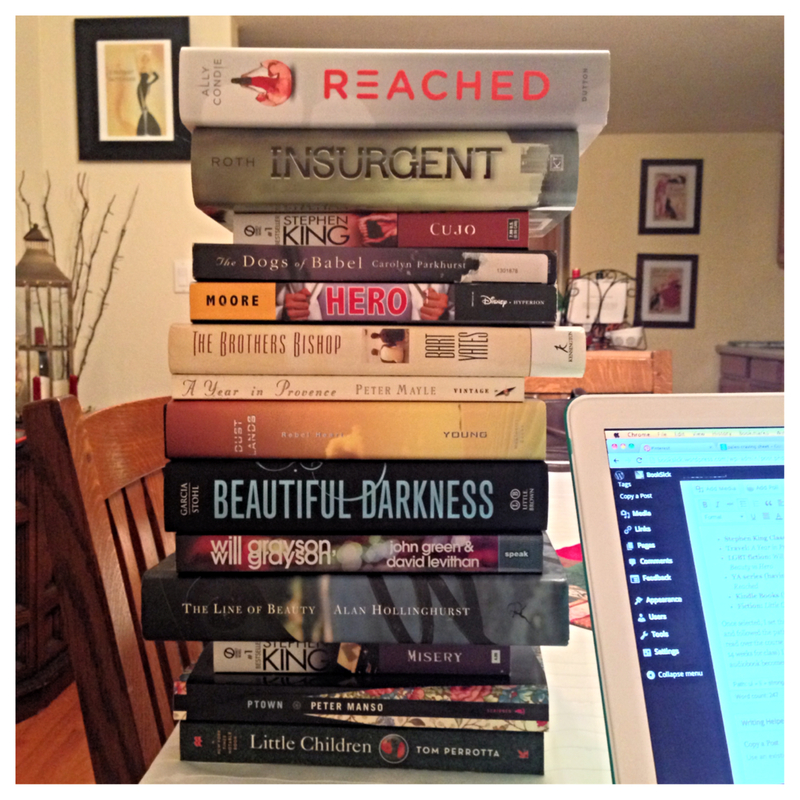 Six months ago I posted an entry detailing my method of selecting the order of what books to read next for this year. Now that it’s June, I thought I would do a quick tally of what I’ve read so far of that list, and what’s in progress. Again, strikethroughs represent finished entries, bold represents currently in progress, and asterisks* represent e-books. I’ve tried to keep things in order, but after reading Cujo, reading another book about a dog turned me off a bit. I got about 30 pages into Dogs of Babel and had to switch over to Danielle Paige’s No Place Like Oz and Dorothy Must Die. (Those will have their own blog post!) Now I split my time between Ten, since I can now read in bed at night, thanks to my Kindle Paperwhite, and Dogs of Babel. Admittedly, looking back along this list, I believe all of the books I’ve finished were in audio format… which could explain why it’s taking me so long to get through Dogs of Babel. Try as I might to get a hold of the audiobook copy, the only one in my library system I could find was at a school for the blind, and my librarian said they couldn’t request it. (Why not?? Ugh…) There is a rhythm to Dogs of Babel’s chapter structure that I am finally getting in to, and I am really surprised by how much I appreciate Parkhurst’s writing style. Her dialog between characters seems so natural and ‘real-worldy’ that I am easily able to imagine illustrious scenes as I work my way through the narrative. That’s the whole point of story-telling anyway, right? On the other hand, Ten is not as exciting as I hoped it would be… I had high hopes, but I suppose there really is little sense in recreating Agatha Christie’s And Then There Were None. Why bother sticking modern day teens on an island and have a power outage? There hasn’t been a desperate attachment to technology that has been built upon to make the power outage worth sending the cast into a frenzy over. I’m about a third of my way into it and nothing is blowing me away… But I’ll save the rest of my judgement until I finish. Every time I sit down to read it, I’m compelled to go ‘home’ on my Kindle to try and read something else, like The Madman’s Daughter or Better Nate Than Ever, but so far, my willpower has been steadfast. Not all hope is lost… yet! Besides this list, I’ve made my way through many other books, all listed on the Unmentioned page, which has just been updated. With all of the new ARCs from BEA this year, I’ll have to take another stab at that separate page… I may just combine them all together and use a different symbol to differentiate them, similar to the e-books. Oh, I can’t wait to read those! As always, stay tuned! Thanks for reading!